Sealed on sides with wood putty. 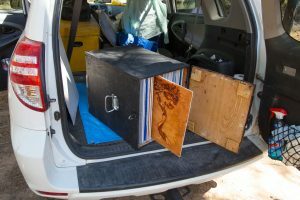 I needed a way to carry a lot of wet oil paintings in the car. My backpackable wet painting carrier box can hold eight 16 x 20’s. Or the same number of 9 x 16’s. So lets say I went on a week long painting vacation and created 2 paintings a day for 7 days, I would have no place to safely store 14 oil paintings. 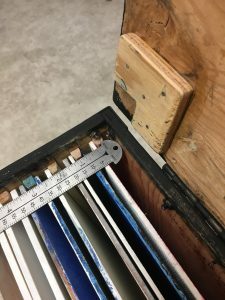 An explanation of my backpacking wet painting box is here. 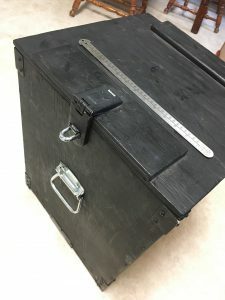 My car box is the same design, just bigger and sealed all the way around with permanent sides, and a hinged top. I also made the shelves slightly farther apart. The gaps in which I slide the double paintings are 5/8″. This means that the 3/8 inch square rods are on 1″ centers. 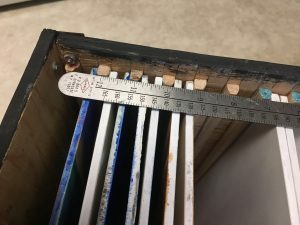 Put another way, when I measure from the center of one rod to the next, it measures one inch. I’m painting on 1/4″ furniture grade plywood, and wanted to try (in future) glueing canvas to the plywood…so the 5/8″ gap was important. 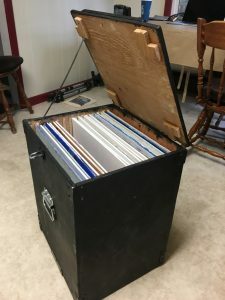 I had some scrap 3/8″ plywood from a shelf under a table in the old house. It was the table on which Clint built his kayak. 15 years later he still has the kayak, but now he has his own house with his own collection of power tools. 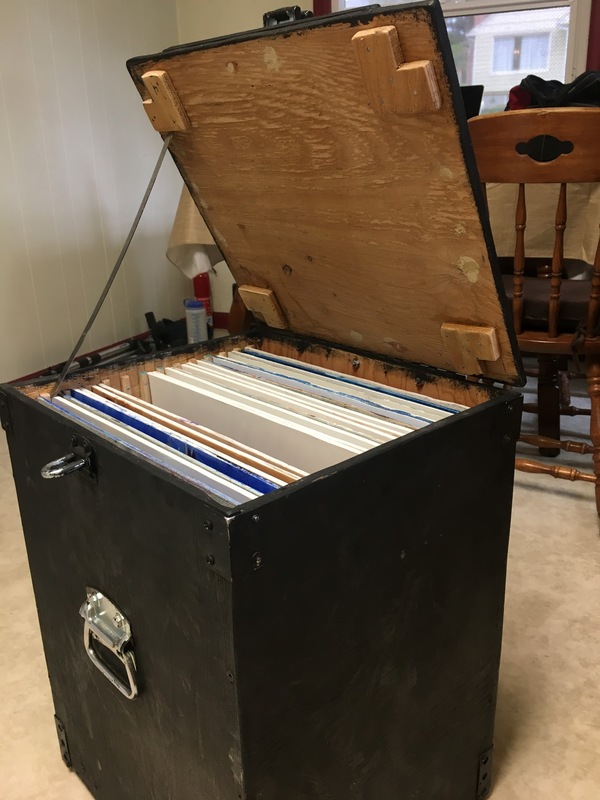 I borrowed his power miter saw, watched a few youtube tutorials and built a wet painting box for the car that can hold 24 wet 16 x 20 paintings. It’s about the size of a large Coleman cooler. I spent at least a couple days out in the shop cutting wood and metal, figuring things out…not to mention many trips to Lowes and Home depot buying screws and lengths of aluminum. I love making things, especially things that solve a problem. No one sells these boxes for artists on road trips, you have to make them. Now I just need to learn to paint better.